Indy Jones is FINALLY on DVD! Was it worth the long wait? You will have to decide - but for the most part – no one should be disappointed. The classic Indiana Jones trilogy (Raiders of the Lost Ark, Temple of Doom, Last Crusade) have all been remastered and are available in a special DVD box-set containing all three films and a 4th bonus disc with all the special features. Most people know the films so why waste the time trying to explain the plot? 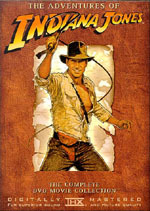 This is Indy Jones – on DVD no less! You know – those films that involve snakes, ripping out hearts, eating monkey brains, Nazis, camels, horses, fistfights, love interests and more! Each film is presented in 2.35:1 anamorphic widescreen and they never looked better. Detail is incredible. A separate pan/scan version is available (but why in the world would anyone buy them?!). A few CGI edits were done – for example the snake’s reflection down in the Well of Souls in Raiders can no longer be seen. Thousands of dust and scratch marks have been removed as well. These transfers look damn good. In addition, each film has been given a new Dolby Digital 5.1 soundtrack. Last Crusade seems to be the better of the three when it comes to sound. During Temple of Doom you might feel the need to increase your center channel level a bit because the active score and sound effects can seem to drown out the main dialogue. These are all fun films and the new soundtracks really add to the experience - even if they seem just a bit outdated. As good as the audio and video is compared to past releases, some might be expecting a bit more in the extras department. Some of the extras are really good to watch, but where are the deleted scenes? Fans would have loved even more – but after all the long years of waiting for these DVDs – can anyone really complain? All the extras are stuffed on the last disc in the box which is broken down as follows: Indiana Jones: Making of a Trilogy, Featurettes, Trailers, IndianaJones.com (web link), Set Up (subtitles), and some DVD Credits. The Making of a Trilogy section is basically three “making of” featurettes with a “play all” option. The featurette runs just over two hours and is presented in a mix of wide and full screen and has Dolby Surround for audio. The documentary has many old and new interviews with a lot of good behind the scenes footage. The Featurettes section contains The Stunts of Indiana Jones (11 minutes), The Sound of Indiana Jones (13 minutes), The Music of Indiana Jones (12 minutes), and The Light and Magic of Indiana Jones (12 minutes). Each featurette is just like the rest – a mix of old footage and old and new interviews. Lastly, the Trailers section contains many teaser and theatrical trailers for the various movies. Each is presented in widescreen with various soundtracks. For Raiders there is a teaser (1 minute, DD 2.0), the theatrical trailer (2.5 minutes, DD 5.1), and the re-issue trailer (1.5 minutes, DD 2.0). For Temple of Doom there is just the theatrical trailer (1.5 minutes, DD 5.1). And for the Last Crusade there is a teaser (1.5 minutes, DD 2.0) and the theatrical trailer (2 minutes, DD 2.0). There is also a special Emperor’s Tomb video game preview (1.5 minutes, DD 2.0) as well. Overall, the Adventures of Indiana Jones DVD box set is an absolute must-buy this holiday season. Yes, Indy is finally on DVD - so go get it and relive all the adventure! Highly recommended.